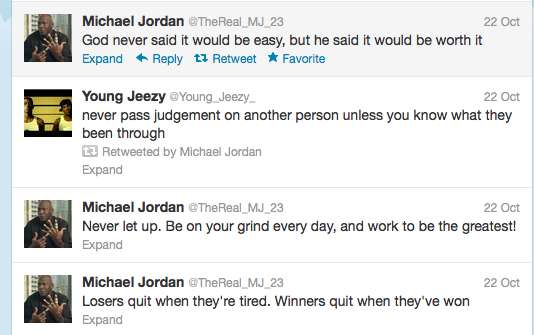 Recently, I have been thinking about whether or not Michael Jordan uses Twitter. The fact that I have been spending much of my waking consciousness turning this one, fairly stupid, idea over in my head should not be surprising. I have always openly admitted to loving Michael Jordan beyond reason or even taste; if nothing is on TV, I have no problem turning on a vintage Jordan film such as Above & Beyond and sitting through the story of Michael Jordan's career through 1996 and completely enjoying it as if I had never seen it before. During parties at my old apartment in Williamsburg, I have unironically played Jordan's Top Ten Dunks on DVD on loop. The fact that I am thinking about Michael Jordan and Twitter should not be surprising. Like anyone with some kind of weird ambition and a lot of interests, I use Twitter for almost the entire period of my waking life each day. I use to sound smart, be funny, share information, self-promote, procrastinate and discover new jokes, articles and personalities. Basically, I am any active Twitter user. One day last week, I noticed that a musician I love, Father John Misty, had retweeted, rather ironically, a tweet from a handle with the name @TheReal_MJ_23. So, curious, I clicked on the handle and was taken to a Twitter Profile of "Michael Jordan." The profile line read, "A real champion plays to win. If you think you'll lose you WILL lose." That kind of attempt at aphorism seemed appropriate with Michael's brand and legacy, so I decided to look at the tweets in the timeline. What I'm referring to is the odd intrusion of a retweet from the @Young_Jeezy_ account. I looked at the timeline again and saw that there were a quite a few of cases of Jordan retweeting Young Jeezy, which, knowing Jeezy's backstory as a middling rapper nicknamed "The Snowman" (a nod to cocaine), struck me as just a little odd. However, the tone of the tweets remained exactly the same—a mixture of inspirational "never say die" determination and New Age acceptance. Again, I figured these retweets must come from the person who handled Michael's account and decided to move on with my day. Later on, though, I couldn't shake the thought of seeing Michael Jordan on Twitter. 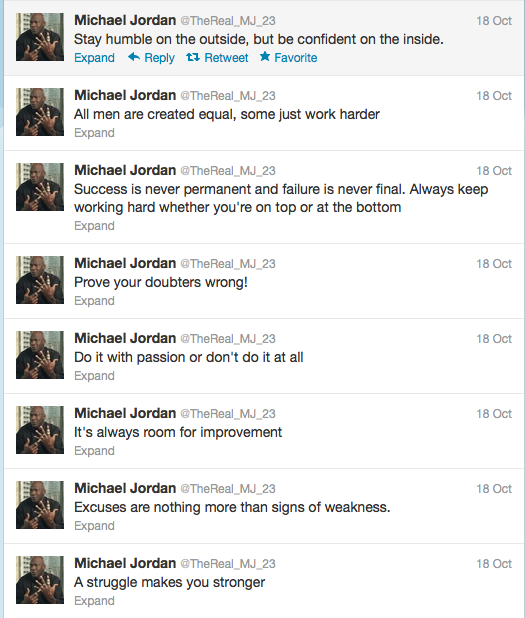 So I did some research on Michael Jordan Twitter accounts. The only real lead I could come up with was an article from March of this year about a fake Michael Jordan account called @__MichaelJordan, which tweeted odd, quirky, un-Michael Jordan tweets. I could find nothing on the Twitter account I had stumbled upon. So, once more I had to resign myself to the fact that this Twitter account was just some lame attempt by the Jordan brand to belatedly extend Michael and his deistic image out into the new social media landscape. And here I am about a week later and the entire concept is still bothering me. I think I've figured it out and the reason is fairly simple. It doesn't matter that Michael Jordan or his brand are on Twitter—nearly everyone (or everything) has its own Twitter account. Also, plenty of celebrities and personalities have other people who handle their tweets—it helps to cut back on public meltdowns and other bad PR. However, in a year where I have been faced with more and more evidence that Michael Jordan was born a human being before he become a God and is bound to die a human being after becoming a God, it was troubling that he didn't handle his own Twitter account. Michael Jordan of all people; the man who took his fate into his own hands; the man who seemed completely in control of human balance and grace or, hell, general principles of the universe like air and space; the man whose drive created a few generations of athletes and non-athletes with performance anxiety issues. 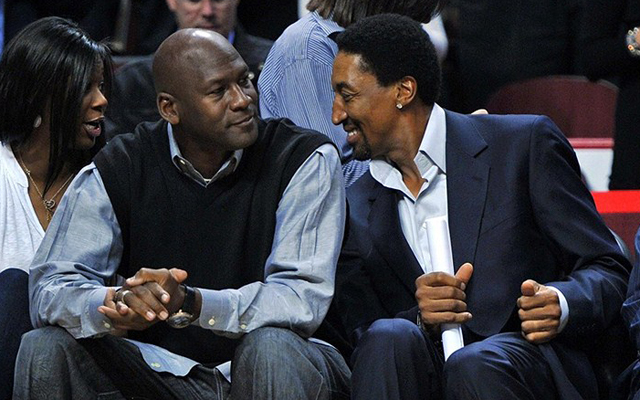 As stupid as it sounds, Michael Jordan is a man who should write his own Tweets. The 2012-2013 NBA season is about to begin. Lebron James, Dwyane Wade, Chris Paul, Kevin Durant, Dwight Howard, Rajon Rondo and other players in the prime of their careers will continue to compete and achieve; they will continue to write and form their own legacies and histories. Meanwhile, players like Tim Duncan, Steve Nash, Kevin Garnett and Kobe Bryant will edge one year closer to the end of their careers (Kobe has already hinted at retiring in 2014). Garnett and Bryant are considerably less Zen than both Duncan and Nash and sometimes I wonder what will happen to both Kevin and Kobe once they reach the end of the line. Those two players, more than any I have seen in the post-Jordan era, seem to tap into that same idea of drive and control that Michael Jordan embodied—in fact, Jordan has become Platonic ideal of those two qualities, maybe because he did seem to hold the essence of those two qualities in his being. Will we find them in fifteen years handling their own accounts for some new social media? Or will they have someone else handling them and acknowledging the bland phrases of some lesser entertainer? Because in the end—and this is shallow—what bothered me more than anything was that Jordan was interacting with Young Jeezy. I made jokes about Young Jeezy in 2005. I have never made a joke about Michael Jordan. But, as you grow older, you are forced to face mortality. At 27, I'm not quite ready to completely accept my own mortality, but maybe I have to get used to accepting the mortality of my childhood hero; my favorite athlete of all-time.